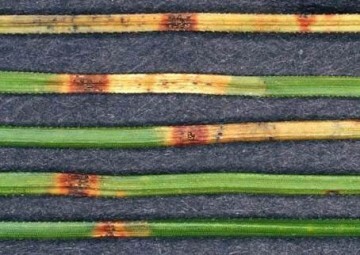 Red band needle blight or Dothistroma needle blight is caused by two fungal pathogens: in the UK the pathogen is Dothistroma septosporum and in USA, Russia, Ukraine, France and Hungary the pathogen responsible is Dothistroma. pini. It can be found on a wide range of conifer species, but pine (Pinus) are by far the most common hosts, with Corsican pine, Lodgepole pine and Scots pine all affected. The disease will cause defoliation year on year which can significantly reduce timber yields until eventual mortality. The disease is characterised by red band symptoms on needles caused by the accumulation of a red toxin, dothistromin. 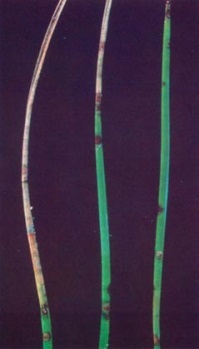 In the field, identification of the pathogen can be hampered in some instances by the absence of distinct red bands, symptoms caused by other pathogens and the presence of general needle necrosis and other needle browning symptoms. The movement of pine plants within the European Union is regulated and authorisation can only be granted if the area of pine production and its immediate vicinity is free from DNB, whereas there are no movement controls on logs, sawn wood, cut trees (e.g. 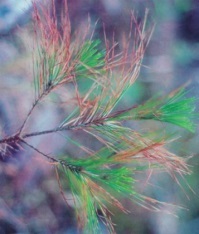 Christmas trees), branches, foliage or seeds, because these products, as these are not considered a significant pathway for spreading the disease in the natural environment. Species-specific molecular testing using the LAMP assay running on the Genie II instrument can be achieved within 30 minutes from a simple crude extraction performed in a non-laboratory situation. The assay has been validated to EPPO Standard PM 7/98 see Table 1 below and allows confirmatory testing of Dothistroma septosporum from foliar symptoms and cross reactions with other Dothistroma species was not observed. When used in parallel with the plant control assay (COX – cytochrome oxidase gene) assay, as an internal control, this assists in the interpretation of negative results.